"If you like spaghetti and pizza, then you'll love this. It is a combination of spaghetti and pizza together." Bring a large pot of lightly salted water to a boil. Break or cut vermicelli pasta into 2 inch pieces and cook for 8 to 10 minutes or until al dente; drain. 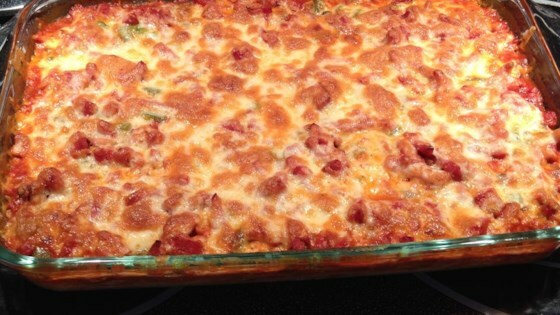 Spread pasta in a 9x13 inch baking dish that has been greased with vegetable spray or butter. In a bowl combine milk, eggs, garlic salt, parsley, pepper and 1 cup of the mozzarella. Pour over the pasta and sprinkle with the parmesan cheese. Bake for 15 minutes. Reduce heat to 350 Degrees F. Pour spaghetti sauce over pasta, top with pepperoni and remaining mozzarella. Cook until cheese is completely melted; about 10 minutes. Make a tantalizing, tasty BBQ pizza with smoked sausage and cheese. I really liked this, really cheap to make and very good!!!! Very tasty. For added nutrition, I used whole grain spaghetti and fresh garlic, no added salt. Delicious...husband and 2 kids (3 and 1) approved. Easy and quick.